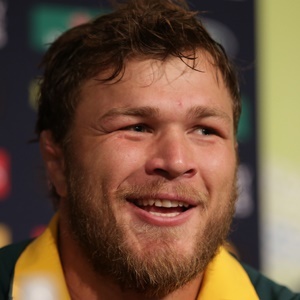 Cape Town - Springbok coach Allister Coetzee says that some of his overseas-based players, including Duane Vermeulen and Frans Steyn, are still in his plans despite their absence from the set-up ahead of Saturday's Test against Ireland. Steyn featured off the bench in the home series against France this year while Vermeulen's last Bok appearance came almost a year-and-a-half ago in a home series against Ireland in in June 2016. The Toulon-based Vermeulen has had injury troubles since then, but last week he declared himself fully fit and hopeful of a return to the Springbok set-up. Coetzee, speaking from Dublin ahead of what is a massive Test against the Irish, said that he was happy with the current balance in his side but that the likes of Steyn and Vermeulen would still have roles to play. "They are obviously in the bigger plan," Coetzee said. "But I learnt lessons last year that the continuity and culture aspect of the team and time to prepare is of essence at international rugby. "The player might be a world class player but he needs more than a Test week to settle in." There would be constant communication with both players, Coetzee said. "We will definitely stay in touch with those players but at this point in time I am really happy with the players that we have and giving them opportunities," he said. "We've got a good team environment going and a good team culture ... that is key for me." Kick-off on Saturday is at 19:30.